So, November 18th through 26th saw the much anticipated arrival, tour, and departure of my beloved parents, Keith and Carolyn - or, as my mom would introduce herself as, Mable. People in Canada find it weird when she does that. People in Japan just plain don`t get it. Anyway, my mom is always a good ice breaker, but I had to fit my dad with a retro, samurai-styled wig for his important introductions. He pulled it off better than Ken Watanabe ever could. 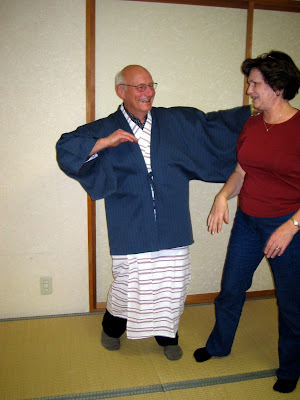 Now, you`ll have to ask them, but I am pretty sure that my parents had a great time in Japan and left with a very good impression. We saw many beautiful sights, but it was the Japanese people that stole the show. Maybe that is because there are so many of them in such a small place that they demand the attention, but I think the main reason was because of their incredible hospitality and overwhelming generosity. They really humble us in this area and it makes me a little ashamed to think of how poor of a host I have been in the past when people have come to visit. You think you are doing pretty good and then you see what truly great hospitality is like and you realize you have a long way to go. Anyway, I think my parents were truly touched by the generosity that was bestowed upon them by our various hosts that I can probably convince them to come back in the not too distant future. So, what did we do? Well, when you think of Japan you probably think of temples, moss, and gardens (and hopefully stupid amounts of snow, based of course on my reports from last year). Yeah, that`s here and we saw that, but there`s nothing too interesting to report on that front. I mean, I could list all the places that we went to and then you would think, "Oh, there! Yeah, I have no idea how to even say it, let alone know where it is." In short, we visited the Tokyo area and the Kyoto area, making a brief stop in my home prefecture (state) of Niigata. Kyoto as beautiful and entrancing, as always, but the highlight for me was taking my parents to my former high school to meet the teachers and students. While I don`t teach there anymore I still consider this school my home. Every Friday I finish work around noon and then drive 90 minutes each way to volunteer at that high school. It is just fun to be there and the students and staff are amazing. Anyway, it was nice to give my parents some first-hand insight into what my life has been like in the past year and to get some feedback on how I have influenced the students and how they have influenced me. Almost a couple of teary-eyed moments there. We were petty rushed that day, but we also had a chance to stay at my mansion - I mean, house - and have a nice dinner. The best part of that being mom reorganizing my kitchen. It was also fun to see how my parents managed staying in a typical Japanese home - that being one without central heating, of course. After that we went to Kyoto, my favorite place in Japan, despite the throngs of tourists, particularly with that week being the peak of fall colours season. Nevertheless, the unique atmosphere of this city is truly special and infectious. The city just has class. In order to save yours truly a little money, we ended up staying in a hostel. Now, I know what you are thinking, but I wouldn`t put my parents up in a hostel if I didn`t know it was quality. This one has been voted the best hostel in Asia and is cleaned more thoroughly than a sumo wrestler`s rice bowl. Plus, they had a private room. Seriously though, this hostel and its staff are amazing and I have never stayed at any hostel that comes close to comparing to this one. Good times. But eventually we had to part ways. Mom and pop got stuck in Vancouver with the snow, while I had to stand on a very expensive train for a few hours and then got delayed for another couple hours on my return leg back to Niigata. Nevertheless, we both made it ok. It was great having them and I am looking forward to them coming back in April with my little bro, Ethan. I am already planning the trip to Universal Studios Osaka. Now, the best part ... pictures! I took over 1GB of photos on the trip and after sorting, deleting, and a wee bit of tweaking I will post them on flickr. Have a looksee. Some of the best pictures I have ever seen of my mom and dad together. Enjoy! By the way, I am going to be in Calgary from December 20th to January 2nd. Looking forward to seeing the Canadians so be sure to let me know if you`ll be around and available. Mark it in your calendars. I remember when your mom told me her name was Mabel the first I met her....I believed her! I'm not just commenting cause I promised to, should you post some new entries. It's just still unbelievably unfair that you get to see that beautiful fall twice and all I can look at are gorgeous pictures! I'm so stealing that picture of the leaves and will put it up at my new apartment. BTW, in my dictionary MABLE stands for mother-always-brings-extra-love (TM Mad About You) - so it makes perfect sense to me, that your mom would call herself that even though it’s not her name.